← Why does a mirror reverse left and right, but not top and bottom? Since F.4 I’ve been thinking long and hard about real-life applications of circle properties. Why do we study them in secondary school anyway? Someone told me they’re used in designing cylindrical structures, but I couldn’t find a satisfactory book or website that explains how we apply circle properties just like we use modular arithmetic in time and date calculations. Therefore, upon discovering the Maths in the Workplace video, I got super excited and researched. The following summarises my findings. I am no match for the masters on this blog (as of posting this article) so I’m posting a rather elementary article here. Mathematics has to be useful, I insist, and that why I’ve taken the road less travelled. Over the edge. Over again. Sunrise sets. Flash of green. The last glimpse of sunset, a green flash shoots up into the sky. In real life, it turns out that the green flash occurs at sunset because of light refraction. As green and blue light bend more than warm colours like red, orange and yellow, the last hint of the sun turns green as it vanishes from the horizon. But how far is the horizon from us? Since the world is not flat but round, how do we measure distances on sea? Thankfully, people all over the world have been doing such problems for ages, including sailors, aircraft pilots and meteorologists. With the travel season in full swing and many of you enjoying your time in foreign lands, these people must calculate in real time the maximum range of communication and vision, so that ships and airplanes avoid collisions and accidents. That is to say, they need to know the distance to the visible horizon, subject to weather conditions. Unlike distances on flat surfaces, distances on sea and in air are measured in “nautical miles” (nm; about 1/360 of a meridian, fixed at 1 nm = 1,852 m), and speeds in “knots” (1.852 km/h). Those who watch the inflight moving-map system or Airshow may be familiar with such terms. What do all these have to do with circle properties? Let’s try a simple question. You’re on a stationary ship with no dry land in sight, and your eyes are x metres above sea level. Assume that the Earth is spherical with radius R and you can see the horizon clearly. The orange sun is setting in front of you. How far will the green flash be from you? The angle between a tangent and a radius of a circle is 90˚. If your eyes are on point B, then by Pythagoras’ Theorem, we can calculate the distance AB to the horizon in front, and AC backward. Note that on a ship, the “bridge” is the control room, which is a certain height above sea level. In airplanes, the control room is the cockpit, and similar calculations apply. 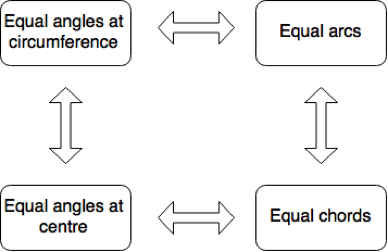 The angle at the circumference is twice the angle at the centre. It would be misleading to call the above “opera house theorems”. In optics, when an incident ray meets the surface of a curve, the angle it makes with the tangent to that point is equal to the angle between the reflected ray and the tangent. But the incident angles and reflected angles, sadly, do not match. It turns out that engineers use ellipses. 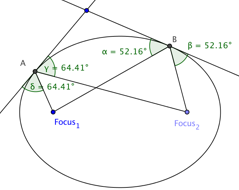 An ellipse has two foci. You can prove that sound from one focus bounces off the ellipse and concentrates on the other focus. So a good foundation in circle properties, as well as those of other conic sections, also helps us arrive at good architectural designs. As a side note, the most famous chord on earth is not do-me-so. (Gotcha!) It is none other than the Large Hadron Collider, which helped physicists prove the existence of Higgs bosons, particles of gravity arising from calculations in quantum physics. To get the right length for the collider, circle properties involving chords came into play. In the first video, the sailor mentions that the distance of the horizon “can vary considerably depending on the size of the ship you’re up.” Head up to the Challenge Corner and find out how bridge height affects the distance to the visible horizon! Some go their whole lives without ever seeing it. Let’s stop complaining how “useless” circle properties are when teachers bring them up, even for pure mathematical thinkers. Instead, let’s be grateful for all our safe expeditions on sea and in air thanks to them. Look out for the green flash while you still can. Don’t go your whole lives without seeing it. Question: For every increase in h m in bridge height, by how much does the distance to the visible horizon increase? This entry was posted in Applied mathematics, Discrete Mathematics, Geometry and tagged circle, Euclidean geometry, everyday mathematics, nautical, Pirates of the Caribbean, popular mathematics. Bookmark the permalink.